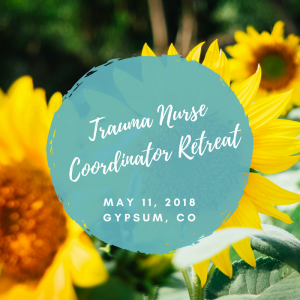 The Trauma Nurse Coordinator Retreat is next month on May 11th. If you are planning on attending, please take a moment and R.S.V.P. below. Please feel free to pass along the flyer to any individuals you think may be interested in attending, including your departments Trauma Registrars. Please Note – There will be no internet or phone service. If weather permits, breaks will be taken outdoors. Any questions please email info@cmretac.org. *If you are planning on sending any additional people in your department, please make sure they R.S.V.P. on the link provided.